Access Inn was once again the venue for the Pattaya Soul Club’s most recent quarterly music bash entitled Souled Out. 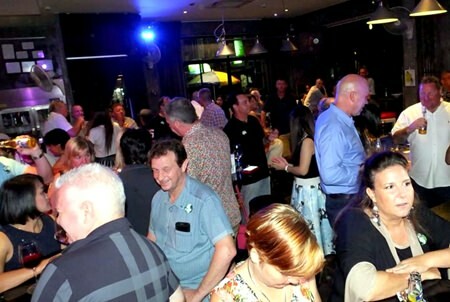 The event, which took place on Saturday, March 19, was indeed Souled Out, with the place packed to the rafters with a mixture of Thais and expats all coming together to relive the heydays of Northern Soul, Wigan Casino and the like. Souled Out is a formula conceived by Earl Brown and Eva Johnson over 4 years ago when they formed the Pattaya Soul Club. Since that time they have fine-tuned their events, broadening the appeal to guests and have received great support from the local business community in the form of sponsorships. The most recent event adhered to all those facets and proved to be another great night out on the Pattaya social calendar. Riviera Group and Fabulous 103FM were the lead sponsors followed by The Wine Bar, Mood Blues bar, Akvavit, Pattaya Channel, Inspire, Scooters bar and Thomas Heal. Ivan, Keith and Andy kept the decks spinning and the dance-floor full with the sounds of soul while soft drinks, beer and wine (all included in the super low 400 baht entrance fee) kept everybody hydrated. Earl Brown (rear left) and Eva Johnson (rear center) along with Ubonjitr Thamchop (rear 2nd right) and Tom Robson (rear right) present a cheque for 54,200 baht to Gio (rear 2nd left) and the children of the Take Care Kids foundation. These events are all held in the name of charity and over the last few years the profits have gone to many local and needy organizations. In the days following this latest event, Eva and Earl, along with Tom Robson from Fabulous 103FM and Ubonjitr Thamchop (K Min) from The Riviera Group, donated 54,200 baht to Gio, the founder of Take Care Kids center that helps care for abused and neglected children. If you missed this exciting night of soul, stay up to date with forthcoming events at www.facebook.com/PattayaSoulClub.